The classic tale of Robin Hood has been adapted for the screen many times, in iterations where the infamous outlaw has been played by the likes of Errol Flynn, Kevin Costner, Russell Crowe, and an animated talking fox, so it was almost inevitable that a brand-new version would pop up at some point with a younger actor like Taron Egerton taking on the role, but not quite as foreseen than Otto Bathurst’s new take would be met with such vile reaction as it has done so far. As of time of writing, this movie is only at 13% on Rotten Tomatoes, with a vast majority of critics calling it a wide variety of words including “embarrassing”, “dull”, and “ridiculous” and with some even calling it the worst iteration of Robin Hood to date. Having seen the film, I can see why they may have come to that conclusion, and I will explain so in a short while, but I think I’m going to be in the minority by saying that this movie isn’t great, but it’s not “13% on Rotten Tomatoes” bad, if only because I’ve seen this kind of film be done so much worse; last year, in fact, with Guy Ritchie’s awful take on King Arthur, which this movie – as flawed as it is – performs circles around that incomprehensible dreck. In this version of the story, Robin of Loxley (Egerton) is a Lord who lives a pretty decent life on his estate with his lover, the beautiful Marian (Eve Hewson), until he is drafted into the Crusades by the evil Sheriff of Nottingham (Ben Mendelsohn, who has another box to cross off on his movie villain bingo card). Four years later, Robin returns to discover that his house has become derelict, the Sheriff and the Church rule the industrial town with an iron fist, and Marian is now shacked up with ambitious politician Will (Jamie Dornan), having believed that Robin is dead. Left with nothing, Robin is convinced to become a vengeful outlaw by his Saracen mentor John (Jamie Foxx, with an accent that flexes back and forth so much it becomes almost laughable) and soon becomes the figure known as The Hood – they never actually call him Robin Hood in this movie, just so you know – who begins stealing from the rich and… well, you know the rest. What you might not know is that this version of the story has already been compared unfavourably quite a number of times to that of Batman, especially in how a masked figure is taking to the streets to stomp out the rampant corruption of the city, but I myself wouldn’t make that comparison. Rather, given that this is a slightly darker take on a man who defends his home by going around with a bow and arrow whilst dressed in a hooded green jacket, this is much more similar to the TV show Arrow than anything else. I’ve not seen a whole lot of that show, but what I have seen I can see the comparisons with that way more than I can with Batman, and almost always this movie feels like a lesser but somehow more over-the-top version of Arrow, only if it were set in the Middle Ages instead of the present day (seriously, half the time I was expecting Robin to tell the Sheriff of Nottingham that “you have failed this city”, it was reminding me of that show so much). Speaking of present day, this movie takes an interesting stylistic approach that uses modern anachronisms in this very medieval time period – for example, the bow-and-arrow combos are treated sometimes like rapid-fire machine guns, characters dress like they’ve just been shopping at their local Primark (Mendelsohn’s get-up as the Sheriff is like he just raided his wardrobe from Rogue One and retooled it to look like a suit from Topman) and several scenes invoke imagery that closely mirrors the Iraq war and the London riots of 2011. I’ll be honest, I kind of enjoyed this style as it was at the very least different than most other Robin Hood movies I’ve seen in the past, and it manages to blend this sort of thing way better than Guy Ritchie’s King Arthur ever could, but at the same time I was sat there thinking about how if they were going so far out of their way to make it look like it was modern times, then why not just set it in modern times? I don’t know about you, but I would be more interested in seeing how this story would unfold if it took place nowadays, not unlike how Sherlock did it, than in something that feels like just another disposable historical action movie which happens to look more modern than others. Some of the action scenes can get pretty silly, with some really bad CGI that really doesn’t do it any favours, but there is a slight sense of guilty fun in the midst of all this admittedly rambunctious chaos, and a lot of that does come from how charismatic Taron Egerton is in this. He’s a likeable actor who’s already been in a variety of roles, from Eggsy in the Kingsman films to lighter fare like Eddie the Eagle and Testament of Youth, and as Robin Hood he brings that same kind of boyish charm that’s been present in most of his prior performances but just about comes into his own as a formidable leading man who you can easily get behind. He elevates scenes that aren’t even deserving of his charisma, as well as some of the action scenes where – bad CGI aside – do look like they were a good bit of fun to shoot, and at the very least he comes out of this with a little bit of dignity intact. Despite the positive things I’ve said about this film, does that mean I thought it was good? Not really; it’s a pretty generic action movie that will largely be forgotten soon enough, but in terms of Robin Hood movies, it’s at least more watchable than the Russell Crowe one (though the Disney version is, and probably always will be, the one to beat). 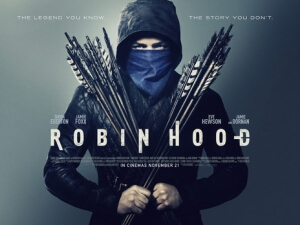 Robin Hood is a generic and largely forgettable action-heavy take on the classic story, but an interesting stylistic choice and a guilty sense of fun – largely from Taron Egerton’s charismatic lead performance – puts it slightly above other iterations.